History, I realised, was real. Built by real people with their own dreams, disappointments, and dailyness. Not at all like the stories I’d read growing up in which people behaved as though they knew they were part of momentous events. I didn’t want to write about the restrictions of gender. Domesticity makes me claustrophobic. Hearth and home are all very well, but I love an epic canvas: gold and glory, politics and plotting. It didn’t work: History is made by real people; the rules always apply. I despaired of being able to reconcile that reality with what I wanted, what somewhere inside I knew was possible. In the end I did what any good Anglo-Saxon would: I got drunk, laughed in the face of fear, and charged. And I discovered what poets have known for millennia, that constraint is freeing. I had nothing to lose, so I committed. The words came. It felt like magic. It was Hild’s voice. Also, I give a shoutout to some of my favourite medieval websites and blogs, including The Heroic Age, The Medieval Garden Enclosed, Unlocked Wordhoard, Heavenfield, A Corner of Tenth-Century Europe, Senchus, Magistra et Mater and Carla Nayland. Thank you Nicola for the shoutout. The interview is really interesting too. This was one of those interviews where I could really get down into it–not the usual superficial publicity crap. I enjoyed it. As for thanking me: No! I owe such enormous thanks to all the early medieval bloggers. 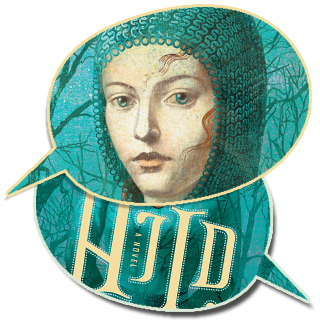 You all helped make HIld possible. Jonathan, you absolutely helped. You and Michelle, particularly, have been so patient with a complete beginner. What's next? More Hild, of course!